The print edition of the November issue of REALSIMPLE magazine features "At the Edge of the Lake" and a short interview with me about what makes my life "what makes my life real simple." "In the Snow Forest" was included in an exhibition of Thomas Kellner's "photographers: network" collection from 204-2013 at the Stadtische Galerie Iserlohn in Iserlohn, Germany from July 12 - August 31, 2013. I am a recipient of this year's Kolga Award. Six awards were given out and my In the Landscape work received the one in the Conceptual Category. As part of the award, my work was exhibited at the Kolga Tbilisi Photo 2013 in Tbilisi, Georgia from May 1 - 7. My image, "At the Gorge," is to be exhibited at the Jennifer Schwartz Gallery in Atlanta and the Southeast Museum of Photography as part of the Critical Mass Top 50 Exhibition. Esteemed curator and collector W.M. Hunt curated this exhibition. 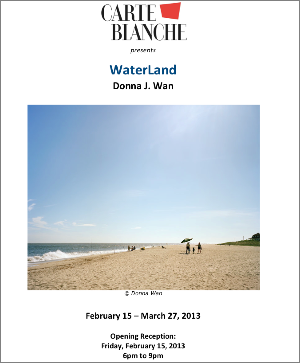 Nice review of my recent exhibition, WaterLand, at Gallery Carte Blanche. "At the Air Strip", 2012, from the In the Landscape project was featured on Flak Photo of the day on November 9, 2012. Both this photograph and "On a Cliff (Overlooking the Surf)", which was in Flak Photo's Looking at the Land traveling exhibition, are included in the Flak Photo Collection. Lucie Foundation's booth at photo l.a.
"In and By the River" and "At the Salt Flats" from the In the Landscape project were displayed at the Lucie Foundation's exhibition space at photo l.a. January 17-21, 2013. 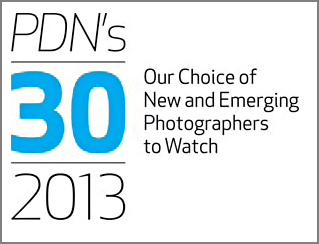 I have been nominated for 2013 PDN's 30: New and Emerging Photographers to Watch. Work from my In the Landscape series has received a Second Place award from Rose Marasco for Gallery Photographica's New Images Photography Awards. In addition to the award, my work will be included in an exhibition at Studio 17 in San Francisco. The opening reception is from 6 to 9 pm on Saturday, November 10th, 2012. 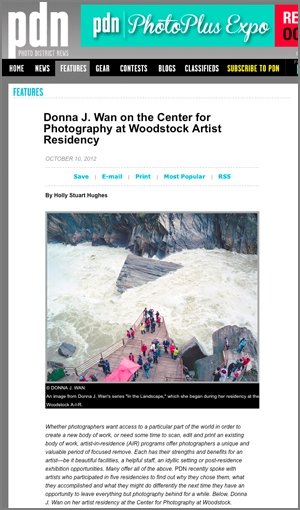 Last month I was interviewed by PDN about my artist residency at the Center for Photography at Woodstock. This interview, conducted by Holly Hughes, editor of PDN, is featured online and is in the current (November 2012) print issue of PDN. I am very excited to announce that I received the APA/Lucie Foundation Scholarship Grant of $5,000. This grant will be used for my new series investigating the natural and landscape places where people have committed suicide. I will receive the award at the Tenth Annual Lucie Awards in at the Beverly Hilton International Ballroom in Los Angeles on Monday, October 8, 2012. Work from Promised Lands was featured on the Conscientious website by Joerg Colberg on August 16th, 2010. I am very excited to announce my first solo exhibition of my In the Landscape series at Gallery 1401 at the University of the Arts in Philadelphia. This exhibition was curated by Harris Fogel, Associate Professor of Photography. I am very excited to announce that I have been selected for the FRESH exhibition at the Klompching Gallery in Brooklyn, New York. Esteemed curator/collector W.M. Hunt and Darren Ching curated this exhibition showcasing the work of four contemporary photographers. Four images from the In the Landscape series will be shown alongside the work of Skott Chandler, Harold Ross, and Ahron D. Weiner.